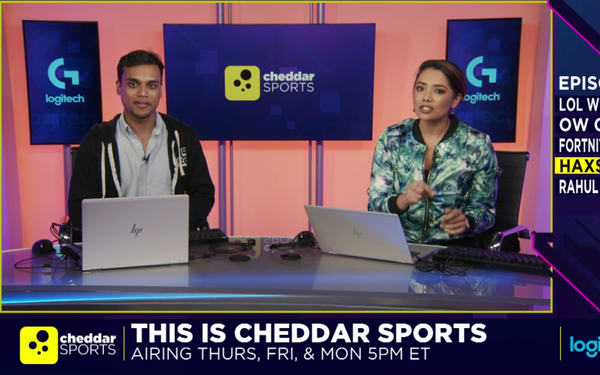 Cheddar, which calls itself a “post-cable” news and business network, just spun that concept out another notch with “Cheddar Sports,” a new hour-long program that will devote itself totally to the esports industry. The show is sponsored by Logitech, whose new Logitech G brand is the first mouse designed specifically for esports pros, as previously reported. It’s already a big sponsor of esports events. But the crowd Steinberg’s talking about know all about "Fortnite," "Call of Duty" and "Red Dead Redemption 2. "And so, when Cheddar Sports reports its news, exactly zero percent of it will be about what passes for sports news on ESPN. All of it will be about gaming. “That’s our beat. That’s our way to be our version of a new Fox, or a new NBC,” Steinberg says. Doing some vestiges of old TV in a new way is how Cheddar has liked to position itself from its start two years ago. Its main claim to fame is its daily business show from the floor of the New York Stock Exchange. That is not so different in concept from something on CNBC — but it’s mostly about tech businesses or start-ups, not GE. Business aspects of esports will be a part of the new show, but it will also feature league and team news, and info on players. For Logitech, the sponsorship results in no commercials. It gets its exposure from constant signage on the program, with hosts and presenters exclusively using Logitech products. Steinberg compares the arrangement to an infomercial. He presented the idea to Bracken Darrell, the Logitech CEO. “Right away, he got it,” Steinberg says. Cheddar is focused on other similar partnerships. When Resideo, the smart home spinoff from Honeywell, went public at the end of October, the new company teamed with Cheddar to make and highlight “The Resideo Tiny Home,” a 125-square-foot dwelling planted outside the stock exchange the day Resideo held its IPO.